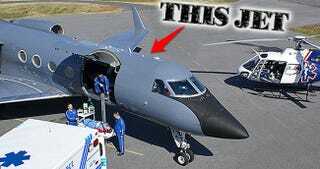 This Amazing Jet Will Transport Ebola Victims From Africa To The U.S.
'F-313' was sold to U.S. military air support provider Phoenix Air in January of 2005. Phoenix Air is well known for providing adversary support and electronic warfare training to the DoD. With their massive fleet of tiger-striped Learjets being forward based near key U.S. Naval installation, they can often be seen lugging electronic warfare pods and anti-ship missile emitter simulators. These jets fly attack profiles on U.S. Navy ships and air defense units, mimicking the tactics and technologies of America's potential enemies. In addition to their Learjet fleet, Phoenix Air has two nearly identical Gulfstream IIIs intercontinental business jets, which are used for rapid cargo transport and air ambulance duties. These jets appear to have been used as government contract aircraft on and off over the last decade, as their large cargo doors and convertible interiors allows them to carry out-sized cargo, passengers or modular medical components and stretchers. Also, the jets' inconspicuous business jet nature and civilian 'N number' allows them to operate in and out of sensitive areas while keeping a relatively low profile. Phoenix Air's configurable Gulfstream III air ambulance is one of the most advanced and capable in the world. Additionally, the Gulfstream platform can do what many other air ambulances cannot: Travel intercontinental distances at high speed, with a good sized medical team embarked. This unique aircraft, and the Federal Government's already close relationship with Phoenix Air, makes the jet and its operator logical candidates for such a challenging mission. For the flight to Liberia, Phoenix Air's Gulfstream III will most likely be outfitted with a modular Aeromedical Biological Containment System, a tent-like plastic structure that is provided with negative air pressure to keep pathogens from entering the cabin. This is in addition to the jet's already extensive medical equipment that can be configured to treat and monitor the patient's unique symptoms during a flight. The jet initially took off on its mission Thursday at 2:03pm EST, but turned back after only 2 hours and 14 minutes of what should have been a six and a half hour flight to the Azores for a refueling stop. Then, at 5:08PM EST, Phoenix Air flight 333, under the callsign "Gray Bird" made its way to the Azores once again. Although Phoenix Air is known as a top tier air ambulance service, with specialized capabilities, and the company does take on some pretty wild missions that take their crews to some strange places (their other GIII is currently at a pretty obscure locale), the DoD does have the ultimate specialized military unit for this type of mission. The US Army's SMART-AID, Special Medical Augmentation Response Team- Aeromedical Isolation Team, part of the US Army's Medical Research Institute For Infectious Diseases, is the Pentagon's crack outfit that was established to carry out this exact kind of task, even in a war zone environment. They are equipped with top of the line equipment and have been on high alert during the Global War On Terror. Seeing as this is the first time an Ebola patient has been brought to the United States, one would think that such a unit would want to handle the mission instead of a government air ambulance contractor. None-the-less, Phoenix Air is a top notch operation, and they are patriots for taking on such a high-profile and high-stakes mission. Although there is some debate as to whether infected patients should be brought back to the US in their condition, let's wish the brave crew and the very ill passengers of "Gray Bird 333" a safe trip with no surprises.